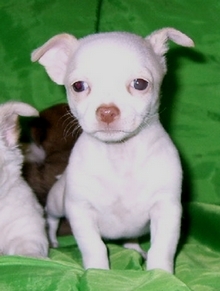 Chihuahua puppies for sale. As an Oregon Chihuahua breeder, our puppies are not only socialized, but acclimated as well ("not really", they still prefer to be indoors or in my lap during snowy weather. But it sounded good! There were 4 boys and 2 girls. Each has been adopted and placed in loving homes, I have kept their pictures up as a sample of what beautiful puppies Tipsy 2 Spot and Sir Rascal produce; although each new litter gives us a variety of colors, markings and coat lenghts. 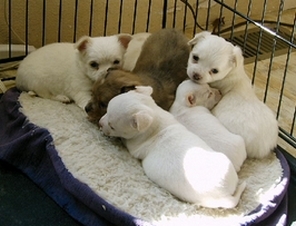 This last litter was unusual as 5 of the pups were White with varying Fawn colored markings. 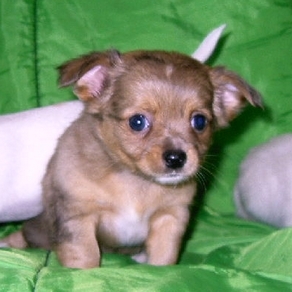 This little male Chihuahua puppy has short legs, a beautiful long hair coat that is brown with black splashes a white mark on his chin, white chest and 4 white paws. This sweet little boy is tiny, weighing in at about 18oz. 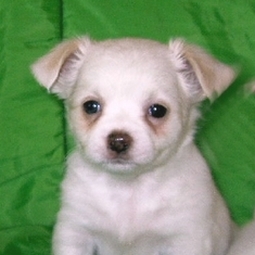 He has short hair and is white with just a hint of fawn on his ears so far with a freckled nose. His ears are already up (the first in the litter). Long hair male, white with fawn ears. Very playful and but loves to cuddle as well. 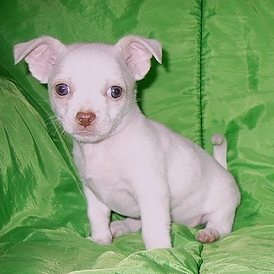 Short hair male, white with fawn ears and eyes and a fawn spot on back. He has a mello disposition, although he loves to play with his litter mates. This little girl has a white long hair coat, maybe getting a little fawn on her ears. She is very alert and curious. A very loving female with white short coat. She should mature about 6-7 lbs. She is a back sleeper, can't wait to see her mature. All our puppies have been adopted and are in their new forever homes. In case you're wondering my grandchildren give them their nicknames, and help in the socialization process by playing with each pup, if they had their way would keep them all! 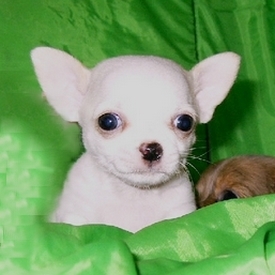 A $100 non-refundable deposit is required to hold a chihuahua puppy. We prefer not to ship our puppies but will consider it if there is no alternative. We have been very successful in shipping our puppies across the US and Canada, an additional fee is charged for this service. Read Payment Shipping Info Here. We are very careful and must set up and coordinate the shipping date and times. If you are interested in any of our puppies for sale, or want more information contact me using the form below. 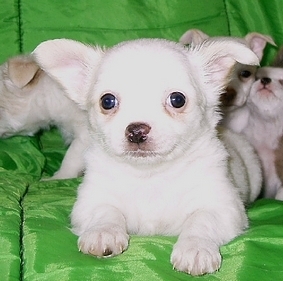 We breed Long and Short Hair Chihuahua.